As an educator interested in sharing your love of science with your students, how do you incorporate the NGSS and STEM in your classroom? The answer is simple. STEM and NGSS are inherently intertwined, which makes the implementation of NGSS easier. The NGSS standards are both exciting and frightening. The three strands of Crosscutting Concepts (CC), Disciplinary Core Ideas (DCIs), and Science and Engineering (S&E) practices require a robust implementation plan along with collaboration and energy among teachers of different grade levels. However, you can start small in your own classroom by building on each unit one by one. Each strand has a distinct purpose in solidifying student learning. Table 1: The three strands of NGSS. The DCIs act as the content standards. Teachers are familiar with the content, essential questions, and learning objectives — because every time we rework a curriculum, we align to content standards. 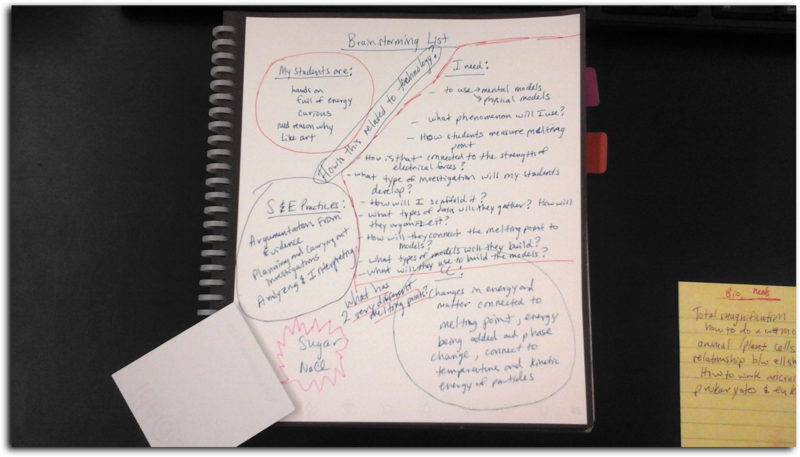 However, the NGSS are more challenging, since the two other strands must also be incorporated. I begin by aligning my present curriculum to the DCIs. Next, I integrate the S&E practices using STEM labs and projects. Finally, I have students write reflections connecting all the labs and projects through the lens of the Crosscutting Concepts. What Should my Students Learn? Choose the DCI that you would like to develop. Using the evidence statements as a guide, brainstorm a list of ideas about the DCI. For example, I chose HS-PS1-3. Use Socratic questions such as: What do we notice? How do we explain this? Develop a research question about the melting point of sugar and salt. Students design a lab that involves finding the melting point of sucrose and sodium chloride. During class, students perform the lab; for homework, students take notes on readings about crystal lattice structures, bond energy, electrical force, and covalent and ionic compounds. Students analyze and determine the melting points of sugar and salt. Class discusses results and discovers melting points are vastly different. Students build models of sodium chloride and sucrose, and use them to explain the process of melting. Class discussion on discoveries about melting. Students synthesize why the melting points are different using Claim, Evidence, and Reason (CER), based on the models of sodium chloride and sucrose, class discussions, experimental analysis, readings, and notes. Extend student thinking and connect with local community businesses and have them speak with your students. Students write a reflection connecting the STEM concept to CER. Each step in the sequence will become a piece of evidence to answer the student-generated research question around a “phenomenon.” The phenomenon could be a video, demo, picture, or something else — whatever you can find to get their attention and make them wonder about melting. For this particular example, I would use Melting Metal in Your Hand. Based on the video, students would brainstorm a list of qualitative and quantitative observations using whiteboards. The Storyline Tool #1: Anchoring Phenomenon Routine, developed by nextgenstorylines.org, facilitates using the Socratic questions to lead students to question the melting point of sugar and salt. Next, students would develop a research question: What is the relationship between the melting point of sodium chloride and sucrose and the strength of the electrical forces between the particles of the substances? Students will design an experiment to find the melting point of sucrose and sodium chloride. I scaffold the experimental design with an Experimental Design Template. Students’ lab write-ups will be graded using a scientific investigation rubric which all science teachers in my high school collaboratively use. From there, students calculate percent error and standard deviation, which leads to a discussion of why NaCl does not melt at 185.5°C, but sugar does. Students will need to build or digitally develop models of the molecules and explain how the forces interact with the particles. Based on their models, class discussion, class notes, and experimentation, students will write a CER to answer the essential question: What is the relationship between the melting point of sodium chloride and sucrose and the strength of the electrical forces between the particles of the substances? The student sample above was the first draft of the CER. Students took the first draft and did a self-edit, underlining evidence from lab in green, from textbook in blue, and other sources in orange, and also highlighted reason in red and claim in purple. Then they wrote a second draft with a peer edit to concretely answer the research question with their mental model. To extend students’ mental model beyond the classroom, incorporate STEM practitioners from your community. For example, we live in a rural community that is full of soybeans and corn. To extend the concept of melting point, I invite a local ethanol plant manager to explain the distillation of ethanol from corn. As a culminating assessment, students write a reflection connecting their mental model to the STEM practitioner’s applications of the distillation of ethanol. STEM is a common application of what students are learning, and it gives them the opportunity to build relationships with future employers while using science to understand the world around them. The idea of STEM is so vast and open that your students can develop, calculate, debate, or question anything that you would like. According to the National Research Council, the benefits of integrating STEM include student engagement, retention, increased student understanding, and excitement for science.i This enables you to differentiate your teaching to meet students’ diverse skills for a well-rounded education for all students. STEM is a medium to engage students in important life skills, such as creativity, perseverance, and experimentation. STEM also allows teachers to convey the complex, messy aspects of the scientific process not found in most textbooks. Anyone can do this by starting with one unit, and following these steps. i National Academy of Engineering; National Research Council; Committee on Integrated STEM Education. STEM Integration in K-12 Education: Status, Prospects, and an Agenda for Research; Honey, M., Pearson, G., Schweingruber, H., Eds. The National Academies Press: Washington, DC, 2014, p. 16. National Research Council and NGSS Lead States. Next Generation Science Standards: For States, By States; The National Academies Press: Washington, DC, 2013. Next Generation Science Storylines, Tools for Creating and Working with Storylines page. http://www.nextgenstorylines.org/tools/ (accessed Oct 17, 2017). Haynes, W. CRC Handbook of Chemistry and Physics: A Ready-Reference Book of Chemical and Physical Data, 92nd ed. ; CRC Press: Boca Raton, 2009. Stacey Balbach has been teaching high school chemistry for over 20 years. A graduate of Luther College, she also holds a Master’s degree in Education from the University of Wisconsin-River Falls and PreK–12 Principal Licensure from Viterbo University. She is passionate about reawakening the inner scientist in her students by helping them to experience the beauty and purpose of science revealed in everyday applications.